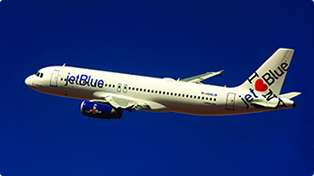 Back in December 2013, JetBlue installed its version of in-flight Wi-Fi, which it calls Fly-Fi, on one airplane and offered the service free while it worked out the kinks and worked on installing the service fleet-wide. Today the airline is celebrating the fact that the service is now available on its entire fleet of 237 Airbus A320s, A321s and Embraer 190s. Fly-Fi is still offered for free – and will continue to be free, an airline spokesperson assures me – and is available gate-to-gate, along with the services listed in the infographic below. To celebrate the milestone, on one JetBlue flight today Amazon Dots will be raffled off and every passenger will get a certificate for a free round-trip flight.